I can actually fit my non-folding Tadpole trike directly inside my SUV; but, getting it up in there is a real struggle for someone that is on their own and putting a wet, greasy trike into the vehicle and messing up the leather interior isn't my idea of a good time. Not only that, a loose trike in an SUV under emergency stop conditions can be perilous to one's windscreen. Not to mention the pedals keep striking the side of your head as you look L/R at junctions. To resolve this I have decided to make a tow-ball mounted rack that will allow me to carry the trike outside the vehicle. The starting point for the rack is a second-hand tow-ball mount from a named brand standard bike rack (THULE). To this, I am going to add an adjustable frame that tips (like a load-ramp) for ease of loading and is adjustable (within limits) for different sizes of Trike. The concept of the rack is fairly self-explanatory I think. The square tubing sizes have been chosen to allow some elements to slide inside others, and these will be held in position with hand-wheel screws. I will add more detail as this mini project progresses. Should solve a problem that confronts a lot of us. As I need to transport 1, 2, or 3, I have been going to make something of a rack to fit a 6' x 4' (even used outdated American measurements there) trailer. Only requires a couple of horizontal beams with adjustable resting brackets for the wheels - two trikes facing forward (side-by-side) and one (in the centre) facing to the rear. It will be done when the need to do it overwhelms the need to do something else. I don't have an SUV but putting a rack on the back of my MPV would seriously interfere with the opening of the rear door, making it, the rack, less attractive than it otherwise would be. I will be following your exploits with interest. The concept of the rack is fairly self-explanatory I think. Maybe so, but we thrive on pics! Today I finally finished the fitting of my tow-bar. Here it is with the base-frame of the trike-rack attached to the tow-ball. I am 200# and I can sit on this base frame and it does not move. The steel for the trike rack arrives tomorrow. It was lovely typical Spring day here in my part of England today. Quite cold first thing in the morning, but later sunny, mild and bright. Lots to do today, a tradesman was coming to fix some snagging issues on a new entrance door installation, a delivery of firewood was to arrive and the shopping needed doing. I elected to stay at home and manage the tradesfolk while the better half visited her Mother and did the shopping. This meant I had an excuse to stay on guard at home and do some "me" stuff for a change. As I said, recently the steel for the trike rack was delivered and battle can commence. First, I did a little survey of typical trike sizes in the market place to make sure anything I built would/could adapt to accommodate any future trike I was likely to make. 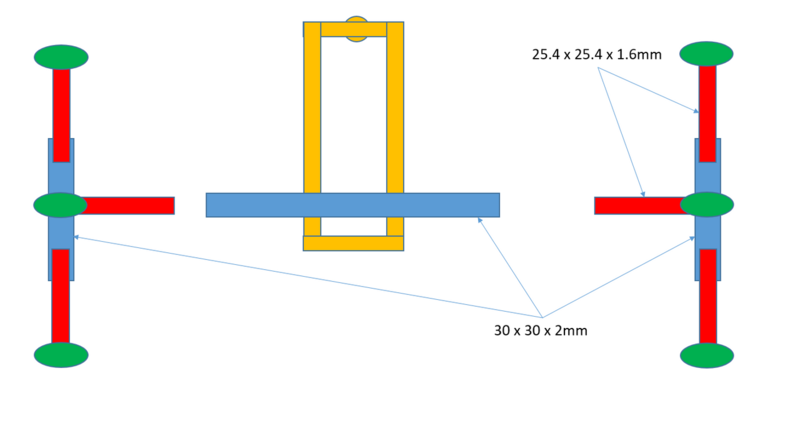 Then I set to cutting the sections of 25.4mm Sq (1.6mm wall) and 30mm Sq. 2mm wall tube to provides a telescopic platform to cover the range of sizes. Then I welded the two "T" shaped ends that slot into the main beam of the trike rack's frame. All the welds are solid, but some are prettier than other (it happens!). After welding I slipped all the pieces together and parked my trike on top of it to get an idea of it in action. A little video of the result is shown below. Today was adding some of the handwheel fixtures to the trike-rack's load-bed. I managed to get 4 of 6 completed before poor light and tiredness set in. They worked well and each end is able to slide in/out of the central tube and similarly the sides can slide in and out and be locked in place. Here's a video clip or two of the ease with which the rack will be able to be adjusted. What stops them vibrating loose ? Once done up they won't move or vibrate loose...believe me....Honest! IF there was a remote possibility of that, I would just add M8 nuts on the handwheel threads and lock them tight. TBH, I don't see that happening. Soon you than me then ? The number of times a wood clamp tightened up as much as possible vibrates loose when using a jigsaw on a workmate is depressing ? Your rack won't be rigid enough not to vibrate with the state of the UK roads and that weight only makes it worse. If that was the actual case then EVERY THULE rack would fall off the tow-ball, because its main bolt would undo wouldn't it?.....And they don't, do they? The rotation of the road wheels induces a vibration, into the frame, with right handed threads the gyroscopic precession rotates the handwheel in a clockwise direction tightening them rather than loosening them. I though they used bigger bolts and lock nuts ? sure I had seen some of the racks advertised with spanners ? On another not I have mainly be less than impressed with those plastic handwheels ? for me after a while they just seem to split and the nut fall out ? I suppose your rack once strapped to the trike wheels cannot change it's shape even if all the handwheels fall out !!! We will see, won't we? I don't think that will happen to be honest, but I will keep an open mind. I am looking forwards to completing it and trying it out. The plan is to have the load-bed level with the metal sections of the rear bumper and to have the rack braced against that to avoid any lateral to-&-fro motion as corners are turned etc. etc. However there are 3 campsites in that village [ West Row ] so it is my intention to see where everyone else is going and get it booked ASAP as I enjoy the area and the rides/locations nearby. You or any other Zombies are of course welcome. Is it that the village-hall site has decided its not a good thing to have the campers, but they like having the event itself? Was a good hoot. Even if perishing cold for an August B.H. on the fens. The frame is made and the adjustable bits all adjust OK. I need to make some wheel-cups/pockets to lash the wheels to. 8mm round bar may be what I use as I have several metres of it. A central gutter/guide needs to be placed on the main spar as an aid to loading. The rear-wheel will go on first and then the front end will be lifted up and the rear wheel rolled backwards along the spine. I have stood on the stem (yet to be trimmed to length) that is attached to the Thule carrier clamp so I know it is sound enough for a trike's weight. Nothing much changed apart from the rack is now welded to the spar on the THULE tow-ball clamp and the spar is trimmed off. I made the wheel-baskets and these will get welded to the telescopic arms and/or independent movable sleeves. A central trough made from a 68mm rainwater pipe will be attached to the main cross-ways beam to assist in loading the trike "rear-wheel-first" onto the rack. With a little luck I should get this all done in the next week and then I can get back to the trike preparation for Holland 2019. The little baskets are on ; the one at the back needs "adjusting" with a hammer. Central gutter/loading-guide next, then the braces that engage against the rear bumper to prevent fish-tailing or rotation of the loaded rack. Do we have a huge list of stuff to do to it ? and not looked at front tyre yet ! The tyres are not going down so I shall leave them for now except to put some air in them Friday and it is good to go ? Some more test-rides free from any issues.....then a few "weldy" bits, a complete disassembly, a scrub down with a wire cup-brush (it is still bare-metal) and 2 coats of paint + re-assembly & test ride. I also need to re-do all my electrical connectors (polarity is straight end-to-end, but wrong according to the markings on the connectors). Need some working lights too - allegedly. A tyre check is a good idea, I will take a spare with me too. Have you definitely made it so you can go W/O a trailer this year? I am taking mine (because the Moonshine-Still and the Jacuzzi must be part of the holiday). We shall NOT be taking the 25Watt-per-channel Music system on the trike this year, in favour of a comb and a few sheets of greaseproof-paper and the "Fred-Karno's Army" Song-Book. A pogo-stick will be packed as backup transportation as usual. Same as you & reflectors ? Have you definitely made it so you can go W/O a trailer this year?